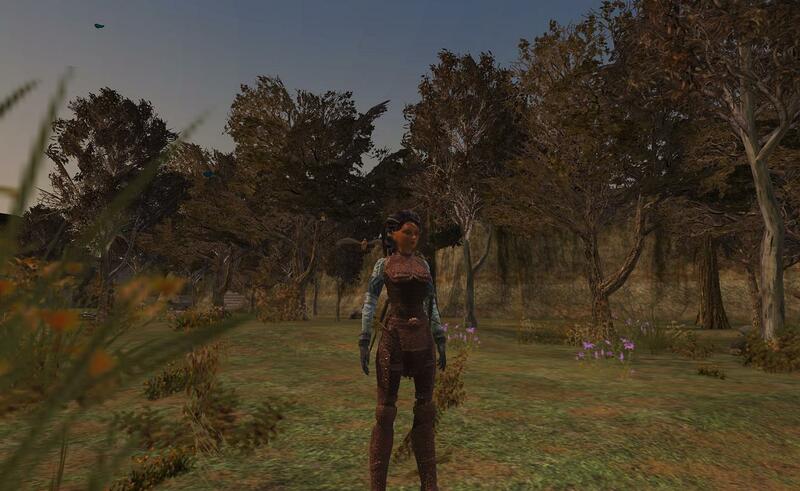 When I decided to give EQ2 another go, I was sort of resigned to a world of strangely shrink-wrapped brown-ness (and strange character models, but I look okay to myself from the back so that’s not so bad). While the graphics are pretty good, they also used to be pretty dull, and not just in comparison with more stylised, hyper-saturated games like WoW. Well, things have changed! While I’m sure much of the basic scenery is still what it used to be (I haven’t been anywhere yet! ), I was very impressed to see that housing, housing items, mounts and who knows what else have taken a turn for the better. There are of course a zillion things in the game now that weren’t there when I last played 3 years ago, and there are lots of other things that have been vastly improved. Mounts, for one — my portly palomino was rather sweet, but he was square, big-butted even for a horse, and with really weird leg movement when seen from behind; now, however, he’s a lean mean transport machine, and it’s obvious the models have been seriously upgraded, since they look a lot more like horses now. I doubt I’ll ever be totally happy with horse animations in games, but that’s what I get for being aware of what horse movements look like; it’s mostly something I overlook as not being particularly important, unless it’s done especially badly. Guild houses are new to me too. I was kindly invited to tour a “medium” sized one, which is only about one-third the size of Versailles but doesn’t give anything away in opulence. 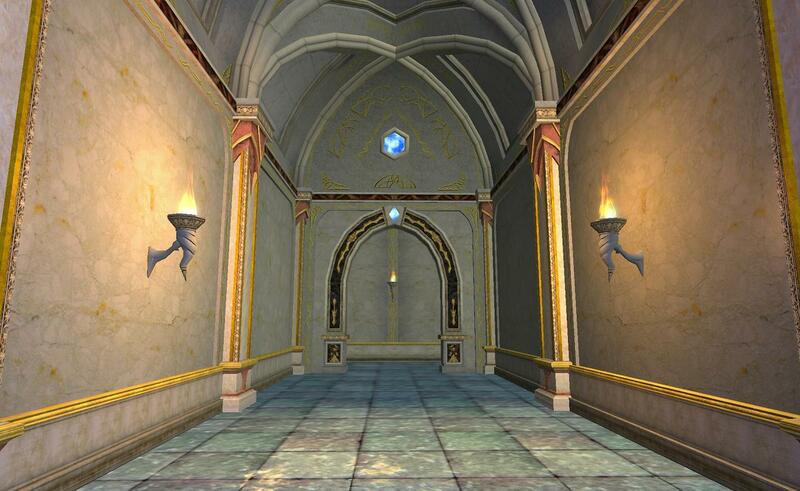 The small and large halls use the same textures but are, as you might guess, smaller and (WAY!) larger respectively. 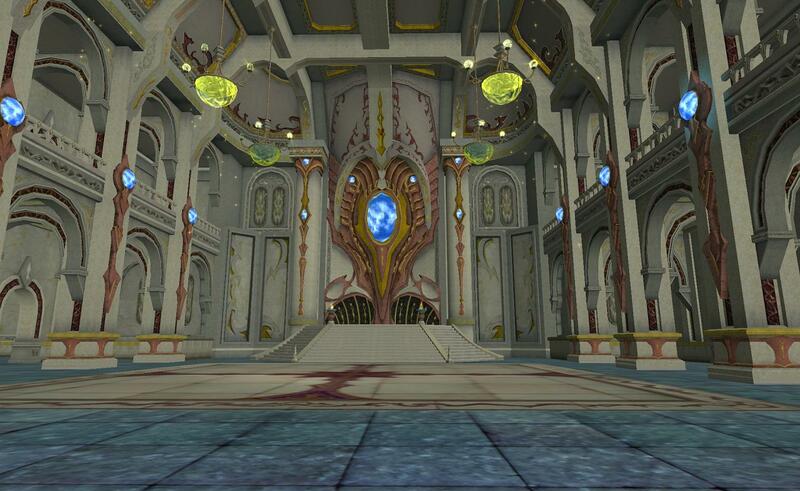 The large guildhall is the first in-game housing building I would say is much, much too large for any but the biggest guilds — any friends & family guild would just rattle around in there and never see each other for weeks. 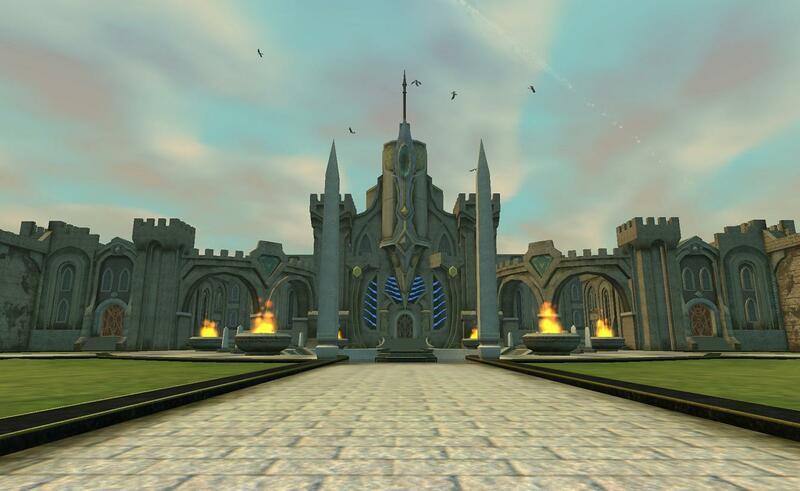 The medium, while pretty big, isn’t quite so intimidatingly huge; though admittedly it also doesn’t have a throne room, an indoor gazebo, a rooftop football stadium (or at least room enough for one), and a freaky monolith in the outsized exterior courtyard. 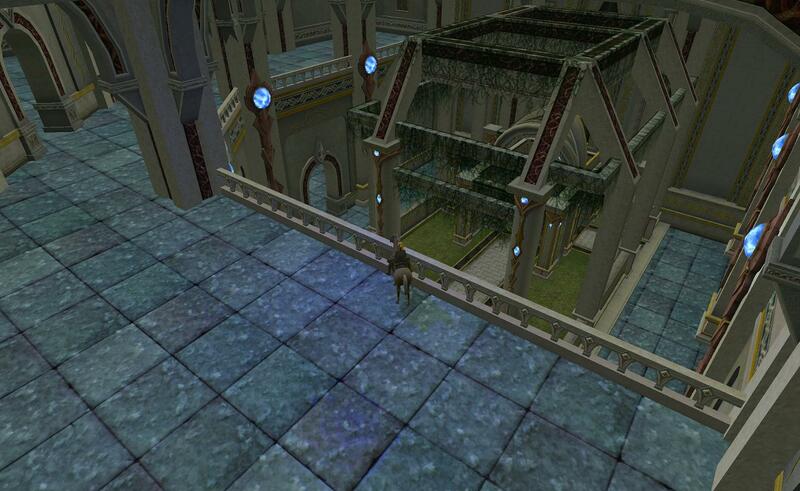 Seriously… the large EQ2 guildhall is the McMansion of in-game housing. If you play and you haven’t toured one yet, I highly recommend it. Since for once I remembered to take a few screenshots, I’m throwing them up here for the doubting Thomases who, like me, thought EQ2 will always be nothing but brown. It still looks like it’s been varnished when it rains (which may be the same kind of effect, but to me there’s no fooling the eye — when it rains in real life, the world looks wet, not varnished) but it undeniably looks better on the whole. Having a better graphics card probably doesn’t hurt either, but in that respect EQ2 might be living up to what it intended, and is ageing more gracefully than I expected. Screenies are reduced down from the original 1920×1200 but they’re still relatively large, so don’t click through if you don’t want to wait for em to load. Isle of Refuge - not *as* brown! 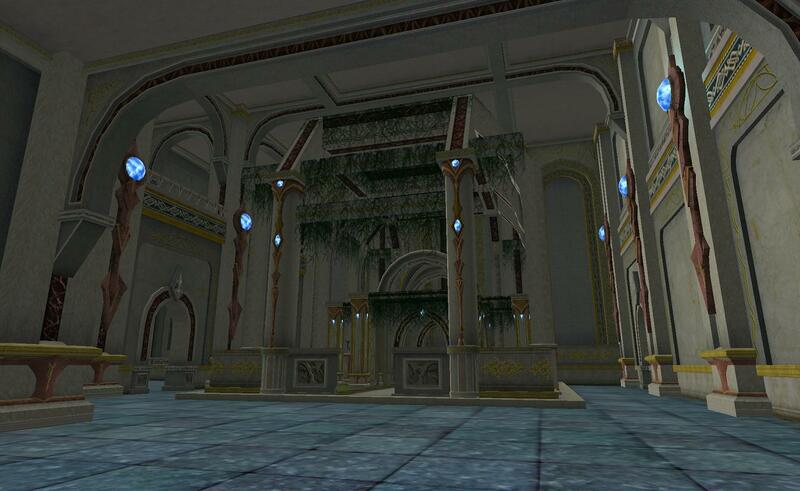 Large Guild Hall - "gazebo"
LGH - Basement. Everyone needs a lake (and helipad?) in their basement, right? Guild hall random hallway - note the lack of brown. 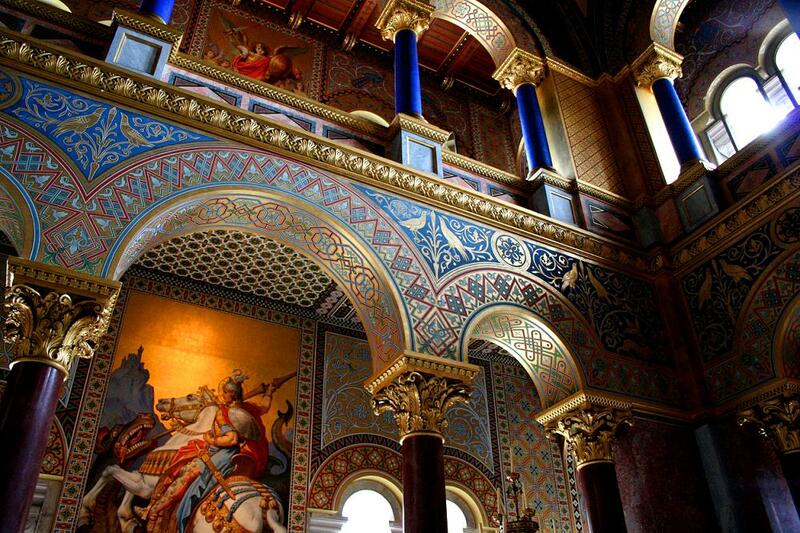 Good lighting, too. Whoa – I had no idea we had a lake in our basement… Actually, I had no idea we even had a basement. Tangent: Speaking of horse animation, what did you think of Dreamworks’ Spirit movie? there is three sizes of guild housing, looks like you looked at the big one. Also, looks like you started on newbie island, you should try starting someplace other then that. if you are good, try Kelethin, if you are evil, try timorous deep. 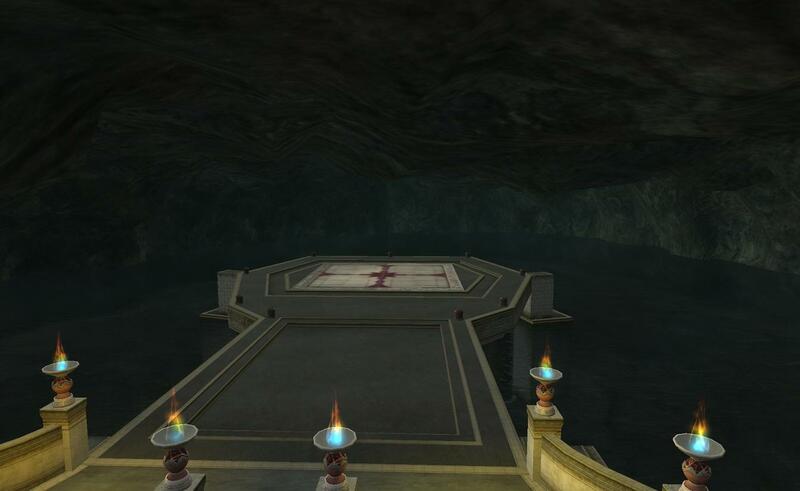 I really like Timorous deep, and then I betrayed to good once I was done there. I keep wondering if it will become very common to reskin games visually. EVE has had its entire visual element more or less replaced between launch and now, PotBS has replaced many of their models, and Blizzard has even talked about giving WoW a bit of a touchup eventually. I think UO is also getting a new 3D renderer. I don’t know of any MMO that’s gone whole hog, like CounterStrike:Source or the new Riddick remaster, where the old game is ported over to an entirely new engine. EVE has probably come the closest, at least visually.